With the first month of the year in the books and the Milwaukee Bucks in first place in the Eastern Conference, it's time to examine the amount of dividends that our portfolio provided for me in January. 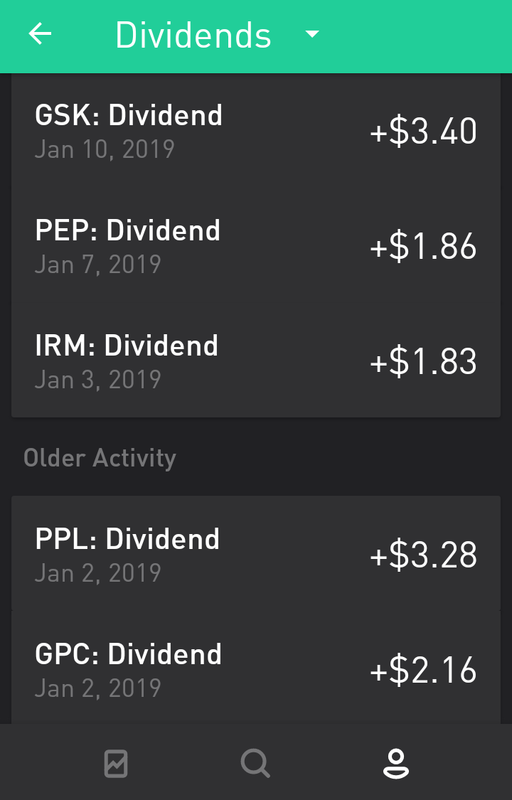 Overall, I received $25.81 in dividends in the month of January. Of this, I received $25.57 from 10 companies in my Robinhood account. The remaining $0.24 came from 12 companies in my M1 Finance account. The $25.81 received in January represents a 21.1% growth compared to the $21.32 that I collected in October. 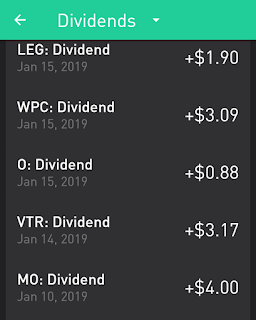 Moreover, this is a 298.9% YOY growth compared to the $6.47 in dividends that I collected in January 2018! Breaking it down further, I collected $25.57 in dividends from my Robinhood account investments compared to $21.13 in October. The Pepsi dividend of $1.86 across my two shares being paid in January. The acquisition of 4 Iron Mountain shares, with 3 paying dividends in January for a total of $1.83. Collecting $0.07 less from GlaxoSmithKline for the month compared to October ($3.47 in October vs $3.40 in January). An additional share of Altria that added $0.80 to income (and another share added shortly after the ex-dividend date). Collecting an extra $0.01 from Ventas compared to October due to a dividend raise in December. ($3.16 in October vs $3.17 in January). Collecting an extra $0.01 from WP Carey due to a dividend raise in December ($3.07 in October vs $3.08 in January). 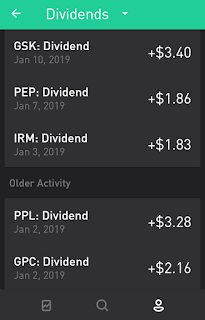 I also collected $0.24 in January compared to $0.19 in October from my M1 Finance October; $0.05 more due to the Pepsi dividend of $0.02 for my small stake and $0.03 from GlaxoSmithKline as I set up my M1 Finance account shortly after the ex-dividend date, so I wasn't able to collect a dividend from them in my M1 Finance account back in October. Overall, January marked a small milestone. It's the first time my first month of the quarter income eclipsed $25, and yet another record for the first month of the quarter. How great are dividends?! I am looking forward to continuing to build my first month of the quarter income and hope to add a couple more shares of Iron Mountain over the next few months. April income should be considerably better as I will receive an extra share of dividends from Altria and Iron Mountain, even if I don't continue to add to my positions. My decisions to add to my Altria and Iron Mountain positions after their ex dividend dates in December will quite literally, pay dividends in April. There will also be a few dividend increases from some of these names factored into that month. My goal is to test $30 for April. With no additions, I'll be near $28 so I believe it can be done. Did you have a record January? Are you working in purchases to increase your first month of the quarter income? If so, what have you been purchasing lately? Keep celebrating those milestones when they come. Before you know it.. $100 then $1000 a month will be coming in. Keep buying and diversifying with those solid known dividend payers. LEG had a big move today. Keep it going strong in '19. Thanks for the encouragement, Keith! Milestones are arguably the best part of the journey aside from collecting the divs. A 290% YoY is a huge progress! Keep it up. Cheers. Thanks for the comment, dsfi! Agreed, I'd certainly love to replicate that progress again. 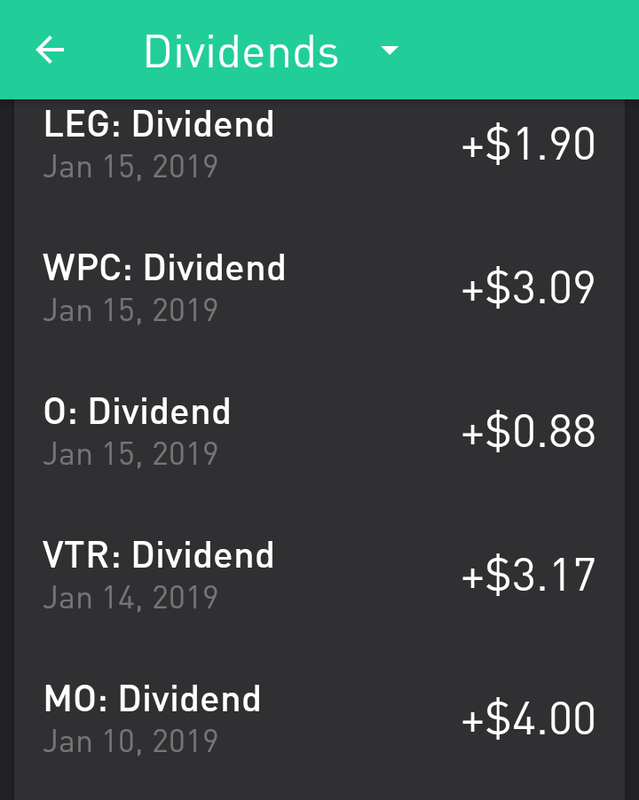 Always great to hit the milestones on the dividend highway. Congrats on the almost 300% YoY growth, Kody. I see we shared 4 dividend payers this month. Thanks for the comment, ED! It certainly is great to reach new milestones with DGI. It's one of the best parts of DGI. Pleased to be a shareholder with you in PEP, MO, WPC, and O.
Kody- congratulations on crossing the milestone. How nice was that feeling? You may think it is small, but look what you are working on building? Soon $25 will become $50, then $50 will become $100, and so on. That's the beauty of dividend investing and why we love the name of this game. Keep at it and keep on crushing it! It's an incredible feeling, that's for sure! Almost every week between dividends being paid, reinvested, and raised, the results continue to speak for themselves. You guys are crushing it over at DD! Keep it up!